What makes a grown woman cross an ocean and sleep for three nights on the street in a “pink princess tent” with her legs hanging out in the hope of seeing Britain’s Prince Harry and American Meghan Markle on their wedding day? “I’m definitely a Royal Superfan,” said Donna Werner, 66, of New Fairfield, Connecticut, about 62 miles (100 km) north of New York City. [post_ads]The chance to lock eyes with Harry or exchange smiles with Meghan as their gilded coach rolls by St. George’s Chapel at Windsor Castle on May 19 is enough to motivate Werner to pay for a plane ticket and a hotel room she’ll likely use only for its restroom while she camps on the street for three days to secure a prime viewing spot. Early that wedding day morning, Werner plans to emerge from the pink circular tent that fits only half her body - her legs tucked into a sleeping bag poking outside. She intends to be well rested, having warded off any overnight chill by plastering her body with some of the 100 hand warmer heat packets she ordered for the trip. Wearing a tiara with a veil and a T-shirt proclaiming “Back-up Bride,” she expects to toss her tent, sleeping bag, camp chair and nearly all her other possessions into a garbage bag in a security sweep. Then, she is prepared to stand for hours in the roadside spot where she bivouacked for three days. “The kings, the queens, the castles, the jewelry and glamorous parties. It’s like a fairy tale,” said Werner, describing what fascinates her about all things royal. “Sometimes, with all the problems in the world, it’s just nice to think that this sort of thing still happens,” said the married, stay-at-home mother whose three adult children are now living on their own. 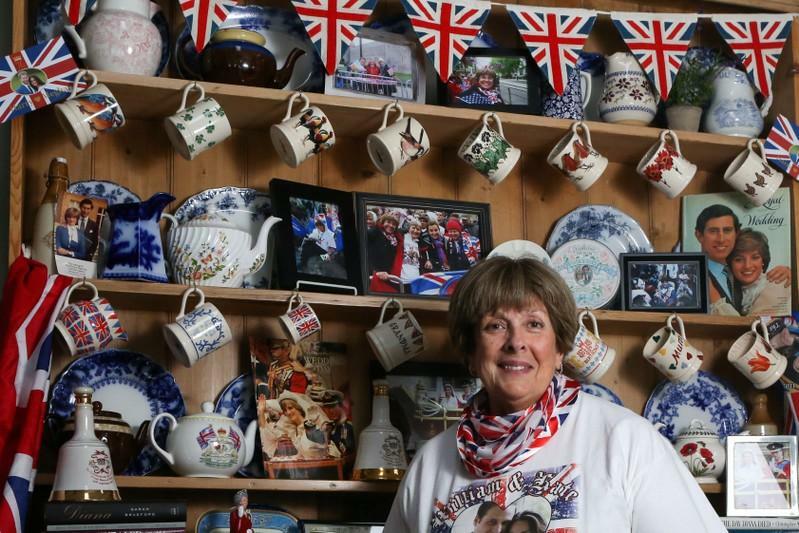 At her sprawling suburban home, Werner’s cupboard is crammed with mementos of British royal celebrations she managed to wedge her way into since her fascination with the royal family began in 1973 with the wedding of Princess Anne and her first husband Mark Phillips. Her Anglophile awe is anchored in research, from her daily check of an online calendar that tracks the royals to tracing her own genealogy back 500 years to the North Yorkshire town of Bedale. To pinpoint her upcoming camping spot outside Windsor Castle, she has been scouring accounts of Prince Edward and Sophie Rhys-Jones’s wedding at St. George’s in 1999. “I want to see what did they do and which way did their carriage turn so I can figure out the best place to stand,” Werner said. Her chiffonier overflows with Union Jack-emblazoned souvenirs like the tiny porcelain thimble to commemorate the 1981 wedding of Prince Charles and then Lady Diana Spencer, and the hefty ceramic whisky bottles to mark Princes William’s and Harry’s births in 1982 and 1984 respectively. But her most prized keepsakes are memories captured in her photographs, including one of Queen Elizabeth looking directly into Werner’s camera during her 90th birthday parade in 2016. “She looked right at me and she nodded her head. I just freaked out,” Werner said. “She’s an icon. Somebody who has devoted her entire life to the public and her country,” she said. “To just shake hands with the queen,” she sighed. Werner’s family tolerates her regal passion, which prompted her to choose middle names of “Elizabeth” for one of her daughters and “Spencer” for her son “much to his chagrin.” Mother’s Day gifts from her children have included dozens of books about the royal family and another pink princess tent to replace one she had to toss in a security sweep for the 2011 wedding of Prince William and Kate Middleton. 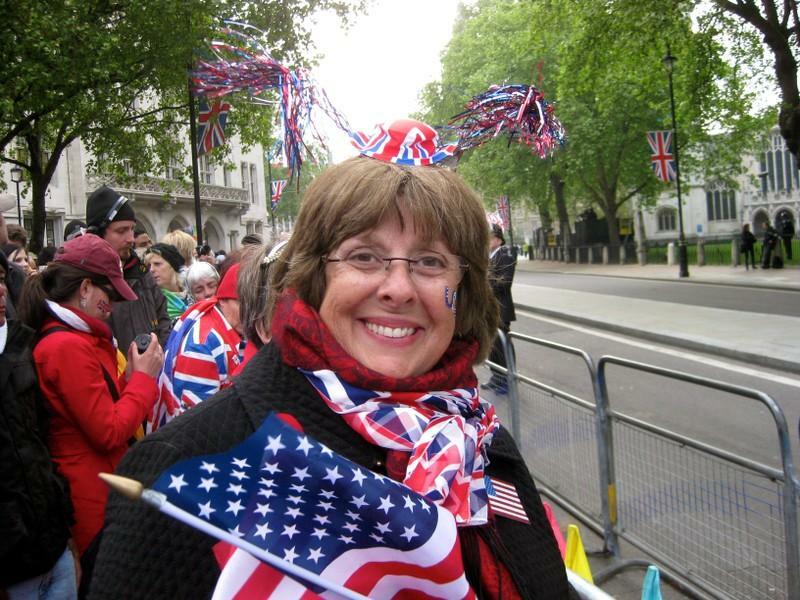 Her husband Mark, 66, a retired investment manager, said he accepts his wife’s preoccupation and her annual pilgrimages to England with a girlfriend as something that strengthens their 45-year marriage, much as she accepts his U.S. motorcycle excursions. Donna Werner shrugged off any denigration of her enthusiasm. “It’s a hobby. It’s not an obsession,” she said, gazing at a coffee cup dated July 22, 2013 and declaring “It’s a Prince!” for Prince George’s birthday, stuffed among commemorative biscuit and tea tins, perfume bottles, milk pitchers and other items. “Well, maybe a little obsession,” she said.